When the orthodontist told me that both kids needed braces, I didn't make the connection that I would be missing out on my bagel fix. I mean, would you? With 75% of the household unable to chew through a proper bagel, I had to get creative. Sure, I flew home to get a decent everything bagel with lox, capers, and red onion see my entire family of origin when we were in the same time zone for a couple of days. But that's not a realistic long term solution for the craving. If the everything bagel as a delivery device is temporarily out of reach, I turned to pizza. I thought the pizza would need something of substance to <gently> chew through, and my farm share had adorable potatoes (Ok, eye of the beholder, I'll give you that), so I consulted this recipe to get the pre-boil/pre-bake technique. The side effect of this technique is that you can finish the pizza (second baking) without parchment. Less chance of burning your arm while shaking the pizza off the parchment paper onto the stone. 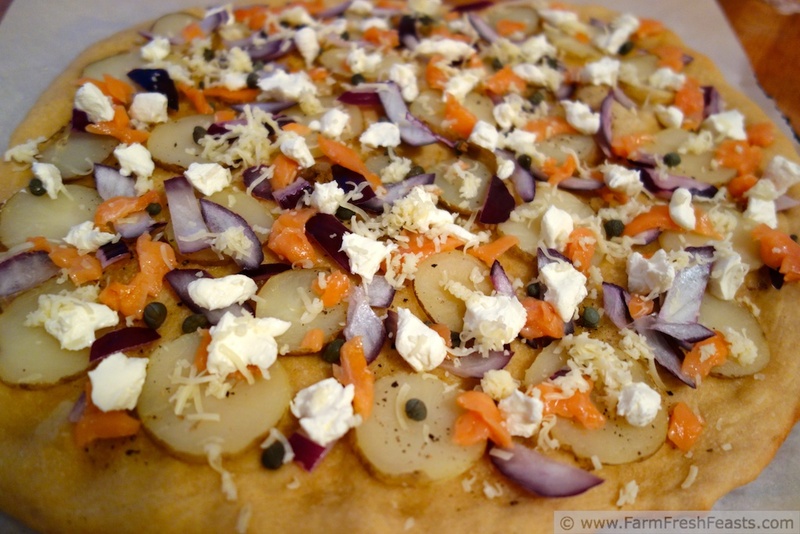 My son and I, the lox/caper/red onion/cream cheese fans in the family, loved this pizza. I think it would be even better if I used a tablespoon of the everything bagel seasoning mix I've seen (onion, garlic, sesame seed, poppy seed, etc) while making the dough. But I tend not to have poppy seeds in the house (one glaring exception!) so I didn't have any. Preheat the oven to 450 degrees Fahrenheit. In a small saucepan over medium-high heat, boil the potatoes in salted water for about 10 minutes. They will not be done, and that's OK. Cool and set aside. In a small bowl blend the garlic and olive oil together with a fork. Set aside. On an oiled piece of parchment paper, stretch out the dough into an approximate circle. Brush with the garlic oil (you may not use all of it). 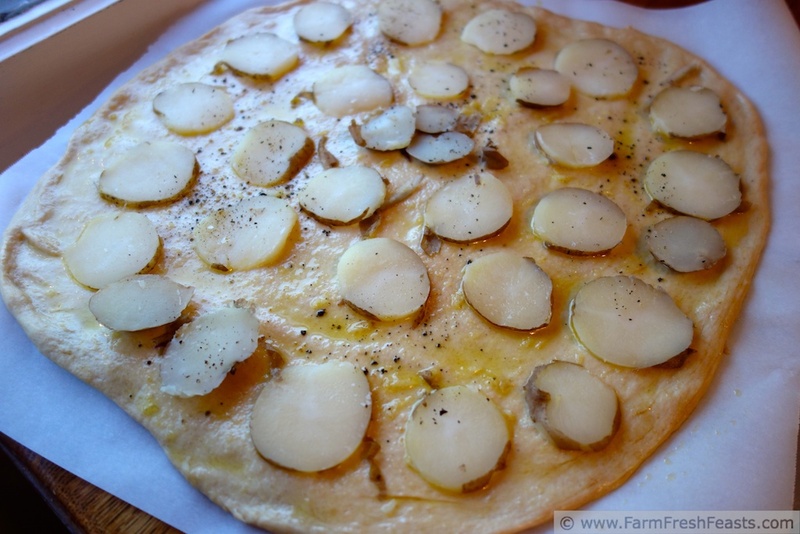 Thinly slice the now cool-ish potatoes and spread them over the crust. Sprinkle with a healthy pinch of salt and a few generous grinds of pepper. 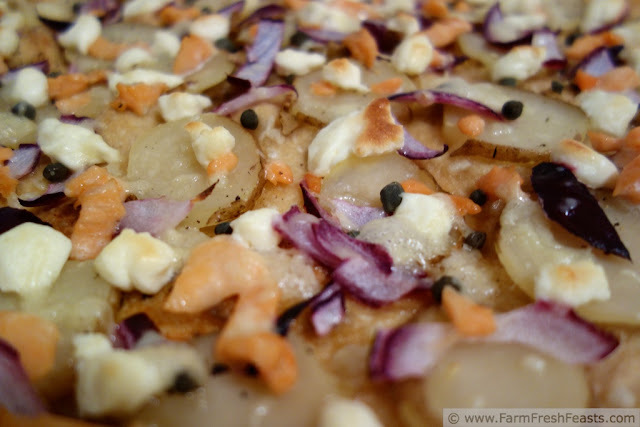 Bake for 10 minutes on a pizza stone or cookie sheet. Remove from oven. 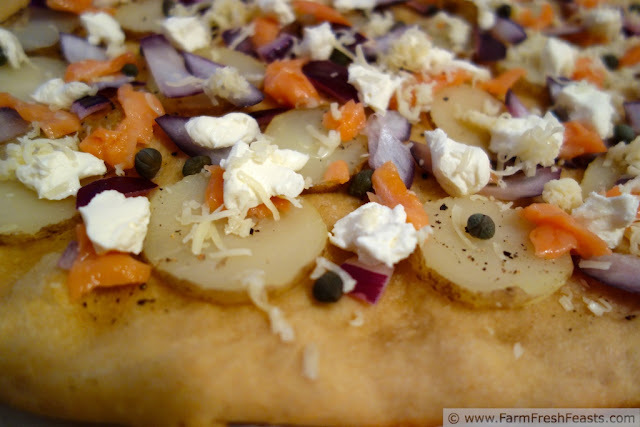 Top the potato crust with salmon**, red onion, capers, and little dots of cream cheese. Sprinkle fontina over top. Add another healthy pinch of salt and generous grinds of pepper. Place the pizza directly on the stone (or cookie sheet) and bake an additional 8-10 minutes until the fontina is bubbly and the cream cheese and potatoes are browned. Cool on a wire rack then slice and serve. **Next time I make this, I'm adding the salmon right after it comes out. I happen to think your potatoes look fabulous, and your pizza is amazing. Talk about over the top creative. I'm thinking about getting braces (yes as an adult; what fun), and I never would have made the bagel connection. I may have to rethink this. By the way, your comments have been making me laugh so hard. I love them; you are cracking me up and making my day. My brother got braces as an adult--I think he's been glad of it. I was surprised to learn that the kids should not eat tortilla chips, popcorn, and bagels. I expected the ban on peanut brittle and gummy candy and the like. They eat tortilla chips. So far (knock wood) only 1 broken bracket due to food--a pizza crust that my son ate. From the school pizza, I must add. Not mine! I'm glad to crack you up--your posts make me LOL! 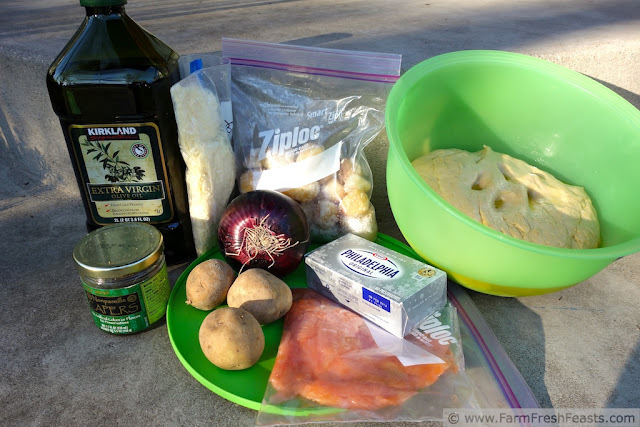 How to Make Kippered Salmon ? From the cold, clear waters of Alaska comes Alaska smoked wild salmon. A special treat for almost every occasion from a Sunday brunch to evening hors d'oeuvres, its rich, savory flavor satisfies even the most discriminating palates. Alaska smoked wild salmon comes lightly smoked and thinly sliced with a silky texture or firm with a full robust, heavier smoked flavor. Its texture and flavor varies according to the salt curing (brining) process, time and temperature of the smoking (drying), as well as packaging and shelf life. Mild Cured and Cold Smoked Salmon has a delicate, moist texture and mild flavor. Commonly called Lox, Nova Scotia-Style or Nova, this smoked salmon has been cured under salt and lightly smoked at very low temperatures.